Is there anyone else out there who loves to free-pile! It is one thing I'll miss about living in our current apartments. Everyone treats a laundry room bin as a free-pile for give and takes. I have found quite the steals there and enjoy using the stuff to cut up to make MORE things. One of the best parts about free finds is that you stress less about them getting worn out. I love less stress. This pair of pants had been hemmed up and worn in. I let down the hem and they did NOT look good. 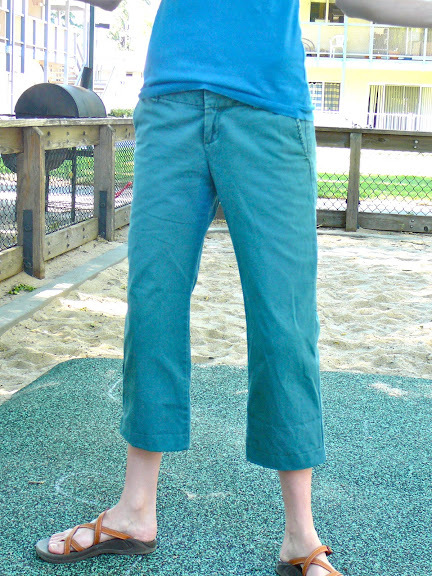 I used a pair of capris that I really like and trimmed accordingly. I ended up having to taper the sides in a bit so they wouldn't look weird. Then it was simply a seam down the side and a hem around the bottom.